German physician; born at Neisse May 12, 1852; educated at the universities of Berlin, Bonn, and Strasburg (M.D. 1876). 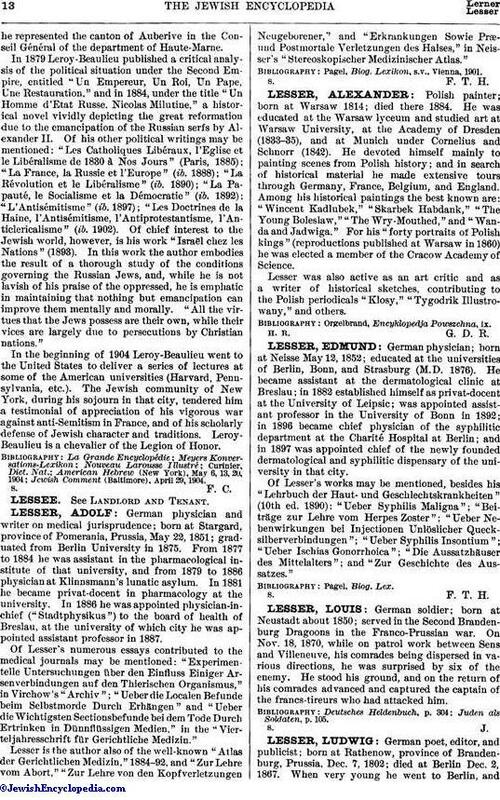 He became assistant at the dermatological clinic at Breslau; in 1882 established himself as privat-docent at the University of Leipsic; was appointed assistant professor in the University of Bonn in 1892; in 1896 became chief physician of the syphilitic department at the Charité Hospital at Berlin; and in 1897 was appointed chief of the newly founded dermatological and syphilitic dispensary of the university in that city. Of Lesser's works may be mentioned, besides his Lehrbuch der Haut- und Geschlechtskrankheiten" (10th ed. 1890): "Ueber Syphilis Maligna"; "Beiträge zur Lehre vom Herpes Zoster"; "Ueber Nebenwirkungen bei Injectionen Unlöslicher Quecksilberverbindungen. "; "Ueber Syphilis Insontium"; "Ueber Ischias Gonorrhoica"; "Die Aussatzhäuser des Mittelalters"; and "Zur Geschichte des Aussatzes."